and human life in particular?" This is the question which impelled G. I. Gurdjieff's search for the origin of esoteric knowledge. Gurdjieff believed that the esoteric knowledge of ancient civilizations contained the answer to his question and so set out to find its origin. Gurdjieff in Egypt retraces G. I. Gurdjieff's journey and his discovery of the teaching of The Fourth Way, an ancient prehistoric teaching of self-development and conscience, which he reassembled and reformulated for our time. Ever since Gurdjieff's arrival in Russia in 1912, there has been speculation about the origin of the teaching, many believing it came from Central Asia. However, through pondering the clues left by Gurdjieff, along with new evidence recently discovered, William Patrick Patterson shows otherwise. We follow him as he retraces Gurdjieff's journey, from the search for the Sarmoung Brotherhood in Iraq, to his finding of a map of pre-sand Egypt, thence to the Sphinx and Great Pyramid, into Upper Egypt and Thebes, Temple of Man, Temples of Karnak, Valley of the Kings, Temple of Edfu, and finally to the headwaters of the Nile. 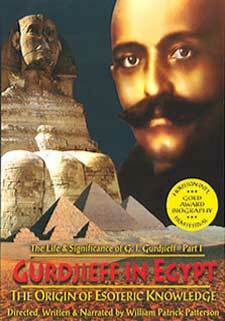 Gurdjieff said he had been four times through the Initiate Mysteries of Egypt. His discovery was, as he said, "This prehistoric Egypt was Christian many thousands of years before the birth of Christ, that is to say, that its religion was composed of the same principles and ideas that constitute true Christianity."